This punch takes just a few minutes to put together, and it makes a big batch. The salted caramel syrup gives it a nice caramel apple taste. And you can use a sugar-free version of the syrup if you like. 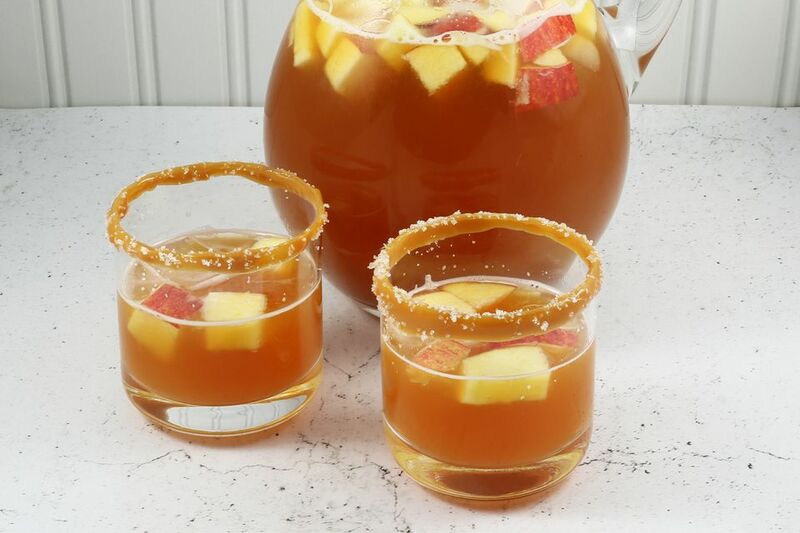 There are many ways to garnish this punch for a party, including ice rings and apple-filled ice cubes. Or just add plenty of ice and chopped apples to the punch bowl or pitchers. See the tips and variations for more flavor and garnish ideas. In a large stockpot, combine the apple juice, ginger ale, orange juice, caramel syrup, and lemon juice. Taste and adjust, adding more syrup and/or lemon juice, as desired. Transfer the mixture to the refrigerator to chill thoroughly. Fill the punch bowl and add a ladle for serving or transfer the chilled punch to pitchers. Chop the apples and add them to the punch along with ice cubes just before serving, or see the tips below for decorative ice alternatives. Put the caramel ice cream topping or dulce de leche in a bowl and lightly dip the rims of serving glasses. Sprinkle with flaky salt. Make decorative ice cubes to serve with the punch. Instead of adding the apples directly to the punch, cut them into 1/4-inch dice and add them to ice cube trays. Cover with water and freeze. Add the frozen apple ice cubes to the punch just before serving time. Decorative Ice Ring or Block: This is a great way to show some creativity, and a large, solid block or ring of ice doesn't melt as quickly as individual ice cubes. If you plan on just one punch bowl over a relatively short period of time, make one ring or round of ice. If you'll be serving over a long period of time and a few batches of punch, make two or three rings. Scatter the diced apples in a Bundt cake pan, one-piece tube cake pan, or round cake pan. Fill the pan with 2 to 3 inches of water. For a little extra color and flavor, use about one-quarter to one-third part cranberry or orange juice with the water. The ring or block will take about 5 to 6 hours to freeze solid. For a red glow, replace part of the caramel syrup with grenadine syrup. For an adult punch with alcohol, add some rum. Think about how many people will be at the party and how much they might each drink. This punch makes about 26 cups. 2 cups of rum would allow about 1 ounce per cup. 3 cups would allow about 1 shot (1 1/2 ounces) per cup.